Produced Process DVD for Client Information and Reception Area Plasma Display. Thirty-two out of the thirty-seven pictures on this site are images taken from the DVD. The 1080 line High Definition TV cameras we use for filming are capable of producing high quality images for internet sites and brochures.Using stills taken from DVD gives the movement effect in the background. 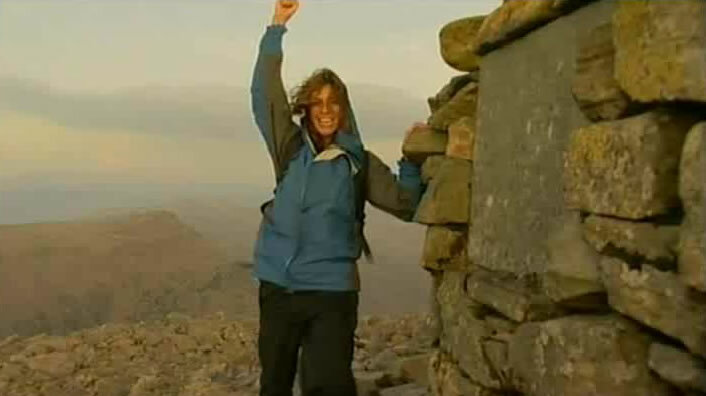 Produced Julia Bradbury BBC Watchdog/Wainwright’s Walks/Rough Guide/Kill it Cook it Eat it/Countryfile/Showreel and Theatre Presentation Keswick Mountain Festival/Douglas Macmillan Mac 4X4 May 2009 Click on the image for Julia’s site. Our Radio Controlled helicopter camera platform carries wireless High Definition equipment suitable for small aerial surveys.Recent assignments include:Television,River area flood damage assessment,Congested Roadway Inspection and Brownfield Development Progress Reports. Available with qualified operator for Commissioned Aerial Survey Dayrate from £2500 plus VAT. Gas Management on-site, Installation and Maintenance Instructional and Safety films. Three Day shoot. Seven chefs working flat out.Everything was very hot under the studio lights to create the Duratrans food displays for the Hotel Restuarants. Multi UK Location DVD for UK’s longest established company manufacturing specialised agricultural buildings, profiling Poultry Arks, Pig Houses, and unique to ARM, closed cell laminated panel production, used at Beamont Building Manchester, and Apartment Blocks incorporating Commercial units Liverpool and Scottish Holiday Lodges. Programme to demonstrate full bathroom furniture manufacture process from slip to showroom completion. We have produced several different manufacturing process DVDs for Aynsley UK and DVDs specific to the Japanese market. Long Term Digital database of PFI New Build schools in Staffordshire. Starting from Demolition, The Build, Completion and In Use. These provide linked interim progress reports. Hot Air Ballooning is an interesting way to fly, with little sensation of movement and no sensation of rising, just a wonderful panoramic view of the countryside opening up before your eyes. This balloon can turn 360 for aerial photography. Very different from the helicopter we are used to. Photography for Tourism brochures for Bass Museum Burton and In-House PR. MD communication video link to HQ for Johannesburg SA Holding Company. UK DVD for USA sourced .Solar powered compacting litter bin. Photographs from VCD and file recovery from deleted smartmedia. Instore Point of Sale DVD. Supplying Brand Campaign DVDs for Branch Communication. Promotional and Television News Reports with Minister of Transport demonstrating Caratrans Compressed Gas Vehicle Fleet working in tandem with Natural Gas vehicle Association. Series of programmes for Food Network. One week to film and edit, driving 1200 miles across UK to interview some very special children. We were very pleased to be able to help the Caudwell Charity in the production of their 2005 appeal DVD.This film was shown in five sections at the 2005 Charity Ball to demonstrate how effectively funding has been used in helping the children.Just completed the 2008 DVD which was sponsored by Coutts raising £150,000. CELTIC provides an integrated service for the design and construction of sustainable remedial schemes for brownfield sites.We have provided digital imaging of site progress to show bioremediation of contaminated soils and the containment and management of volatile and semi volatile components. Training DVDs Exclusively for NHS Health Professionals as part of Continuing Professional Development and to enhance The Patient Experience. The DVD ‘Giving Young People a Sporting Chance’ forms a major part of the Alternative Education Programme spearheaded by The Government, to provide structured leisure and exercise facilities for young people. This is a unique collaboration between Health, Education, Social Services and Community Policing. Cornwall Tourism Promotional Direct Mail DVD and Website information. Digital Diary of NEC Hall door installations progress, Nottinghamshire and Leicester Fire and Rescue premises automatic doors and Mercedes Showroom as well as other high profile client installations in UK. Interactive DVD developed for use by Olympic sports coaches to provide guidance on current training methods. DVD for Teacher Information produced with Schools Curriculum Development Education Service department filmed in West Midlands Museums and Heritage Centres to promote activities for school groups. Produced in partnership with Inspiring Learning through Experience, and follows on from The Primary National Strategy for schools to ‘take control of their curriculum and be more innovative’. Links with PPA time for teaching staff. Construction and Redevelopment site DVD Reports from 1998 onwards filmed at Davidstow, Hartington,Crudgington, Carlisle,Chadwell Heath, in fact all Dairy Crest locations. Brown earth to completion of Nuneaton Highbay NDC. Site Safety Induction DVDs. Materials and Equipment Handling DVDs. Warehouse Picking Procedure DVD. HGV Driver Training Interactive DVDs for Dairy Crest Logistics. Full process promotional films Brochure Photography and DVD for roof and floor tiles from Church and old building Restoration in rural Wales to Roofing and Bakery floor at Tesco Sunbury, Oil resistant flooring Toyota Liverpool and Swimming Pools/ Railway Staions/ Nightclubs in Bournemouth and Wigan. Crane shots of exclusive UK housing developments. DVD and digital imaging of accident scene using images taken from a helicopter and Landrover for ground access. Firearms product imaging for brochure and internet. Clarification, enhancement and duplication of Surveillance Generated CD/VHS for legal purposes. Promotional Videofilms in Staffordshire Installation Locations. DVD on Coastal Surveillance Radar and Vessel Traffic Systems. This DVD required use of Helicopters, Power boats, Harbourmaster Launch and was filmed in locations we had only ever heard about before on the Radio 4 Shipping Forecast. Easat is an amazing Company run by very clever people, all of them with brains the size of Planets. Two week UK based location DVD to show Logistics and Distribution Networking filmed at Excel’s many UK NDC bases. Bike Show Marketing DVD for Exhibition Size Plasma Screen. Digital imaging from Earthworks, Steel Framework, Cladding to date 26th February 2006. Manufacture and Technical DVD for Market leader in the manufacture and design of Dual Plate Check Valves for use in the hydrocarbon, energy and process industries. Multi language DVD for Plasma Display China, duplication to 512mb USB Flash Drive keyring giveaways. Highways information digital imaging press releases downloads to Client’s Server Hub. Pump maintenance and support film. Preparation of legal documentary film for industrial injury claims arising from accidents at work and working methods leading to long term disability. UK Theme Park DVD filmed on location at Alton Towers, Thorpe Park, Butlins (several locations)Drayton Manor Park, Beach Resorts. This DVD followed ride construction and commissioning and demonstrates the commercial success of HBL games installations. Preparation of legal material from supplied CD/VHS. Location DVD demonstrating and explaining Investment Powder and its uses in Jewellery Manufacture. Digital Imaging of large on site Industrial Plant, with the images manipulated to remove the factory background. Promotional DVD of extending platforms and conveyors filmed throughout UK at sites including Port of Hull, National Distribution Centres and other Kaybe clients. Archival film to DVD. Collaboration with Research Fellows in Scientific and Technological fields. Duplication and legal evidence preparation. Antecedent event filming for legal purposes. Filming Conferencing and technical Information films for Mass Transfer Product in Packed Tower Internals for Petrochemical and Pharmaceutical Industries. Promotional instore and duplex DVDs for this sensational new product which has been a runaway success for Graham Robinson, the inventor of the B21 tipping wheelbarrow and many other innovative products. Numerous DVDs at locations across UK for this premier glass laminating company. Expert Witness Report comprising images and measurements to illustrate scene of alleged events for both sides. Enhancement of VHS/CD-ROM evidence for legal admission. Behaviour and Body Language film at Branch Level, Staff display images for customer recognition. LONDON FASHION WEEK Live event launch for Tesco fashion buyers. Guest show filmed at The Sanctuary, Covent Garden. Live shows at Brent Cross for Gap & Warehouse. Full staging, Lighting and Audio Package supplied by us. UK locational imaging for UK style edition of French Holding Company Catalogue and website. Filming took place over a number of weeks throughout the academic year at the Training Ground where the excellent Manchester United Team Coaches led several coaching sessions with groups of teenagers who have ASBOs, are Tagged or have been excluded. Barry Healey, the Project Coordinator, believes that Sport is a great leveller and cites tangible changes in the behaviour and outlook of these very disadvantaged young people. Barry has a passion and a vision to use sport and high quality facilities to provide opportunities and enhance life chances. DVDs are distributed to The Minister of Sport and other key people. DVD on Customer Service Training Techniques with Automotive Advantage and Mercedes. Dual carriageway Streetlight removal for contractor roadworks and installation.Mechanical & Electrical Works Services (MEWS) Ltd. MEWS source, install and maintain just about any type of non-domestic illumination, including streetlighting, area floodlighting, high mast, feature lighting, tunnel lighting and Airfield Ground Lighting (AGL). Expertise also includes motorway communications work, remote monitoring control equipment and High Voltage and Medium Voltage distribution systems. MEWS is one of the first companies in the lighting industry to gain certification to the new Quality Management System Standard BS . Imaging for Morrisons In House Publications. Preparation of sales details of ceramic equipment for whole factory plant disposal duplicated to VCD for global distribution. Pirelli, NDC Barton under Needwood, Digital imaging from Brown Earth, Steelworks, Interim progress, Completion to Commission. Site image record from start to finish of the first of two hotels at Trentham. Digital Progress Reports from brown earth through steelworks, cladding, internals and key handover. Promotional DVD from Forestry Commission in Lockerbie to manufacture of pressure treated renewable resourced timber products including fencing and commercial decking and buildings. DVD of UK plant installations. Multimedia digital imaging and Editing for the Wireless Group projects. Filming live events for promotional DVD. Location site digital imaging of equipment for local UK and Pruit Humphries Powers & Monroe, St Marks, Florida. Evidence enhancement from CCTV and other media. Day shoot DVDs at Cheshire sites to show sporting facilities and useage. Worked for St Modwen since 1995 producing DVD and Digital Imaging reports of locations from planning development to final completion UK. Use ofhelicopters for aerial land surveys, site development progress digital imaging reports, from A50 Trentham Lakes, Stoke-on-Trent Festival Park, Etruria Office Village. Fun people to work with by the way. DVDs on Healthy Eating and Litter Collection in schools. Promotional DVD for housing improvement schemes. Chroma background presenter work and 360 degree virtual showroom elements for their Orangeries and Conservatories website. Subway sponsors of Connexions Coaching events at Manchester United DVD for Brand Development. Industrial Injury site films. ‘Day in the Life’ documentary style DVDs to explain level of client daily living impairment as a result of RTA/Industrial Accident. Produced DVD for Midcots at NEC and preparation of evidence supplied by Trading Standards for use in prosecution. DVD of air packing material. Digital imaging for PFI New Builds. Filming Events Management DVD for Trentham Host Camera for visit of HRH Prince Andrew. Edited Historical material for the Visitor centre and supplied Plasma Screen equipment. Supplied DVD we filmed from 1995-2005 onwards to create archive history of complete Trentham Development. DVD and voiceover for Visitor Centre. New Chefs on The Block filmed on location in UK hotels. DVD featuring Daniel Bedingfield, Darren Hayes, Liberty X, Texas and Events Management Logistics to attract Client Sponsorship Deals. DVDs of generic products badge-branded for High Street Chemist. Breastfeeding Pump developed with Research and Development from Dr Jimi Frances-Morrill. In the DVD users described the Whittlestone Expresser as efficient, comfortable and simple to use. Its unique mechanism vastly improves the breast feeding experience of many women.